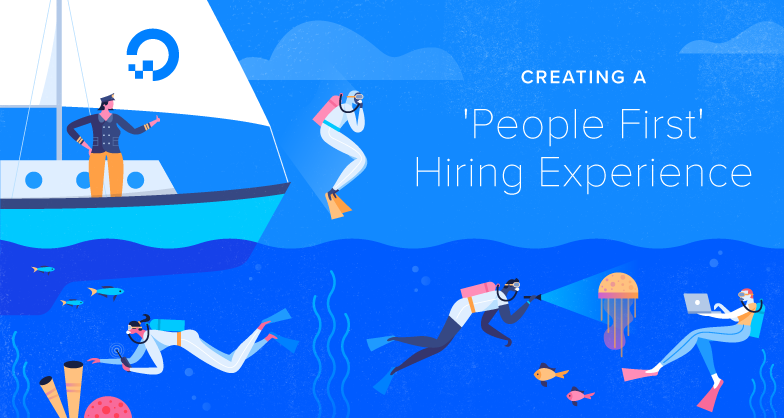 This post is the first installment of a two-part series we’re publishing around recruiting and the new hire experience at DigitalOcean. When I joined DigitalOcean in March of this year, I was the 281st employee at the company. We’re now over 350 employees, over 120 of whom were hired this year alone, and our goal is to surpass 400 by the end of 2017. 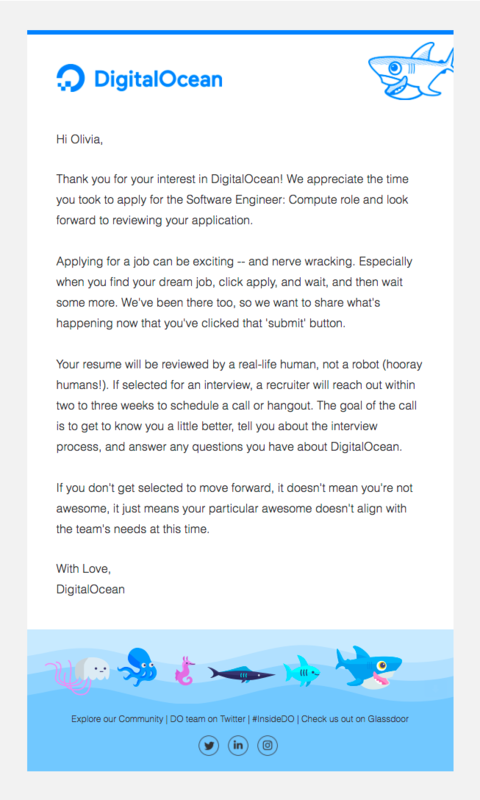 2) DigitalOcean is committed to being a “People First” organization. By investing in the People team upfront as a critical, proactive resource, DigitalOcean has recognized that showing love to both our customers and employees is essential to our success as a business. Fusing together these two takeaways, the need for a Recruiting Operations function becomes critical, especially in today's HR-tech landscape. The war for talent is real, leaving recruiters with limited bandwidth to focus on process improvements and a constant sense of urgency to make great hires. I joined DigitalOcean from LinkedIn, where I worked as a Customer Success Manager helping Enterprise Recruiting Teams (similar in size and scale to DO) optimize their LinkedIn solutions to hire most effectively. When I was given the chance to expand upon this experience by coming in-house to DO, I was inspired by the opportunity to add value to a growing company in brand new ways. Having a dedicated resource to ensure we are using best practices, understanding the analytics behind our pipeline performance, evaluating recruitment tools and implementing data-driven recruiting strategies enables a company like ours to grow and scale. So, while my role is largely focused on increasing hiring efficiency and implementing technologies and tools to automate, my true passion is fueled by the experiences I’m impacting for everyone throughout the recruiting process. Experience matters at DO—from user, to candidate, to employee. A study from CareerBuilder showed that “nearly 4 in 5 candidates (78%) say the overall candidate experience they receive is an indicator of how a company values its people.” In recruiting, a positive experience is intertwined with anticipating what’s going to happen next, and the candidate should feel as respected, valued, and loved as any employee. That includes proactive communication about the process and why it’s important. We believe it’s important to be transparent about what you can expect here at DigitalOcean, in any capacity. The nature of Recruiting Ops impacts several groups. In this post, I’ll touch on on the candidate and employee experiences. In addition, we believe both candidates and Recruiters win when the recruiting process is more personalized. We’ve replaced the traditional “Recruiter Phone Call” first step with a video chat over Google Hangout. By encouraging candidates to participate in a Google Hangout, our Recruiters can get a truer sense of the candidate, and the candidate a truer sense of who their partner will be throughout the remainder of their interview experience. And because we’re a highly remote-friendly organization, we include video conferencing as a normal part of how we connect on a daily basis. Time to Hire: We measure time to hire as the number of days between req approval (which kickstarts the hiring process) to offer accepted. Industry best practice is ~60 days, and we’re working tirelessly to beat that! Length of Journey: We want to ensure a quick and transparent process for our candidates, so that they’re not left waiting for information. We consider length of journey as the days between the first candidate interaction to when the hiring decision is made. Our goal is to ensure no candidate hangs around waiting for a decision for more than 30 days from their first interaction. From our DigitalOcean Neighborhood Guide for non-local candidates joining us onsite to interview, to our employee handbook (available to the public soon), we offer resources to ease the candidate journey every step of the way. Stay tuned for that employee handbook. In the meantime, watch our short culture video (produced by The Muse), which gives a sneak peak into what it’s like to work here. You’ll get to see our office, and get a sense of DO’s culture via interviews with some of our most talented employees. By partnering with awesome companies like The Muse, LinkedIn, Glassdoor, and more, I’m able to help showcase the amazing work our teams are doing and the experiences our employees are having. Our LinkedIn page introduces candidates to our leadership team, and there you can also read employee testimonials and employee-written blog posts. We also share product and content updates on LinkedIn to tell our story to users and candidates alike in real-time. We’re actively building tools to give folks outside of DigitalOcean a better understanding of what the employee experience is like here in hopes that they—or you!—will want to join us (we're hiring!). 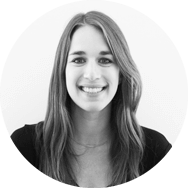 Olivia Melman joined DigitalOcean in March 2017 as the People team’s first Program Manager. She is heavily focused on automation and collaboration within the full-cycle recruitment process, strengthening external partnerships to promote DO’s employment brand, and leveraging data leveraging data to drive Recruiting strategy.